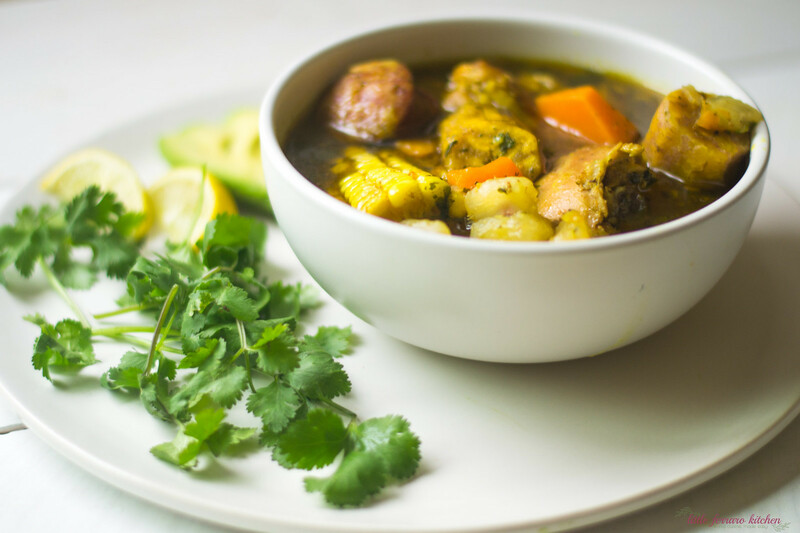 Dominican Sancocho Recipe is a hearty three meat stew filled with robust flavors of sazon, adobo and packed with hearty bites of yucca, plantain and corn. One of my favorite ways of experience different cultures is through their food. Of course I would love to have a best friend in every cultural group to share insights, history and recipes with me..but honestly, I just gotta jump in and go for it and hope for the best. 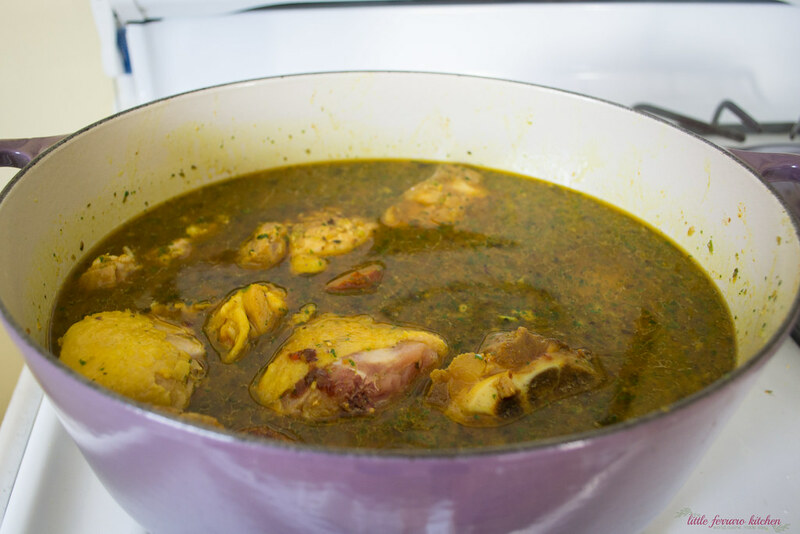 I felt the same way when I made this Dominican sancocho. I was watching an episode of one of Anthony Bourdains shows and instantly felt intrigued! After all, he was the one that influenced us to adventure outside of Istanbul and enjoy one of the best breakfasts we’ve ever had, so naturally I took his opinions seriously. Thanks Tony! 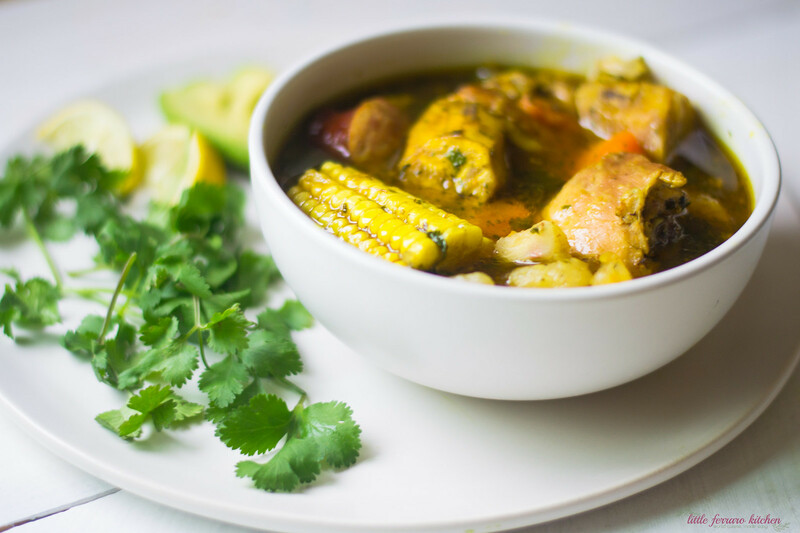 This Sancocho recipe is a new corner one for me. So new, that I didn’t realize the effect of making it would have on others. And let me mention, this is a very humble abode to the people of DR and to the countries national dish. Only served and made for special occasions, think weddings or large family parties, I knew I was stepping in big shoes…HUGE! Should I have the guts to make such a respected stew? Yes, and why not, right? This is how we learn and how we experience, by jumping right in head first and going for it. I instagrammed when I was making this sancocho and immediately got a text from a dear friend “My friend just saw your sancocho, how do you know about it? It is a very Dominican dish”. That, I knew i was in good quarters. So let’s break down what sancocho is, and please, any feedback, suggestions, corrections- I’m all ears! This is why I love learning and sharing food and culture, so we all can educate each other! 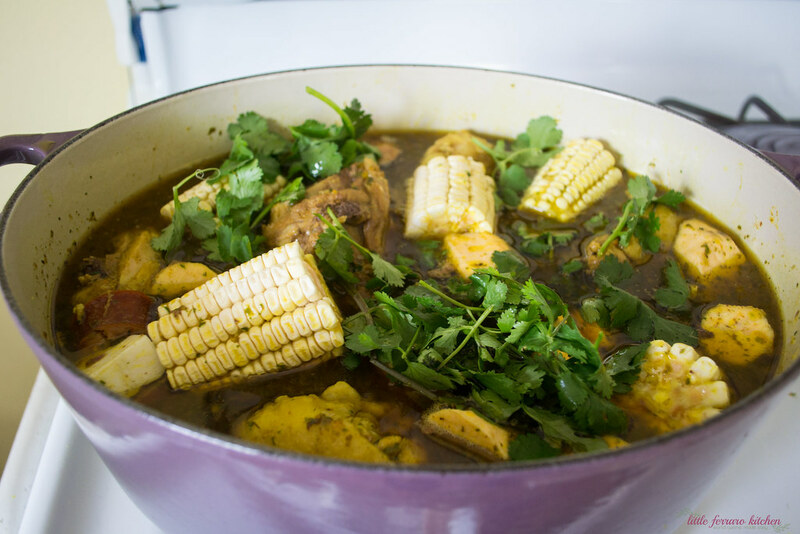 The sancocho dominicano I made is a three meat stew filled with yucca, plantains and butternut squash. I seasoned the meat with adobo spices, including my homemade sazon seasoning and added big flavors of sofrito and bouillon to the stock. The root vegetables is what I had the most fun with, some I couldn’t find at my local mercado so I stuck to root vegetables that were available, such as butternut squash and yucca. 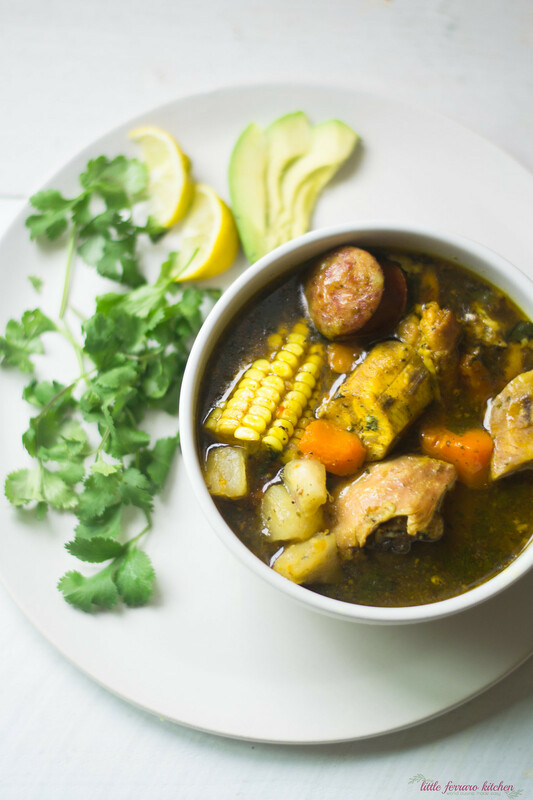 The hearty vegetables can last in the stew for re-heating and at the same time soaks up all the delicious stock that just gets better the longer the sancocho sits. I’m a huge believer in using that you have or what you can find! I couldn’t find some of the traditional root vegetables that would normally go into the sancocho recipe. If all you can find is sweet potato, add that, and corn is found everywhere, so that’s an easy addition. So how did I do? Let’s break it all down! 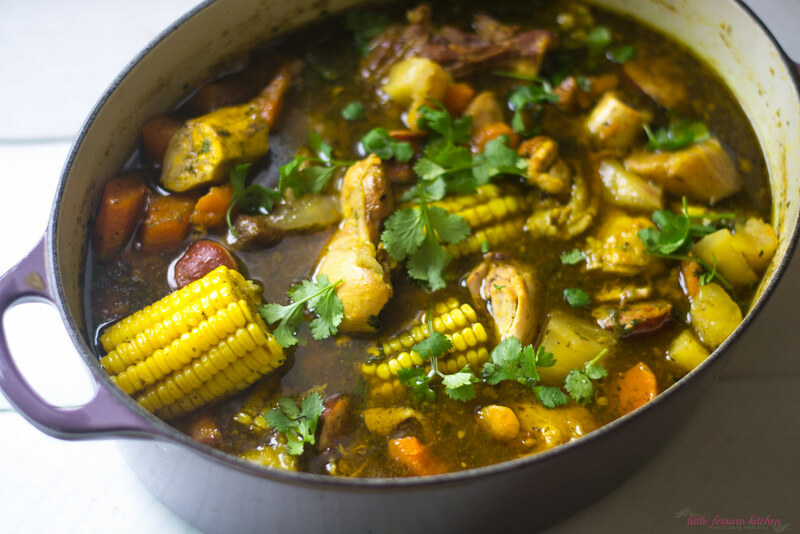 Once everything in, the Dominican stew is smooth sailing and lasts for several meals! 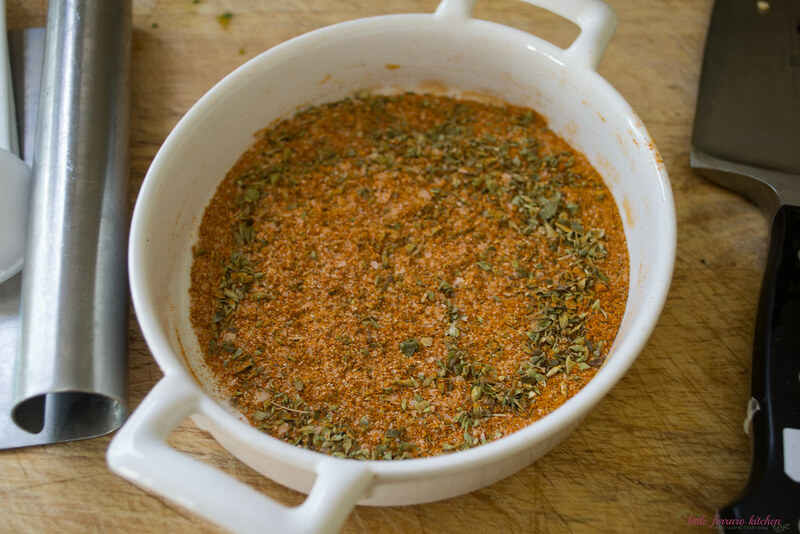 1)First, add all the adobo spices together in a bowl and mix well. Then do the same with the sazon. 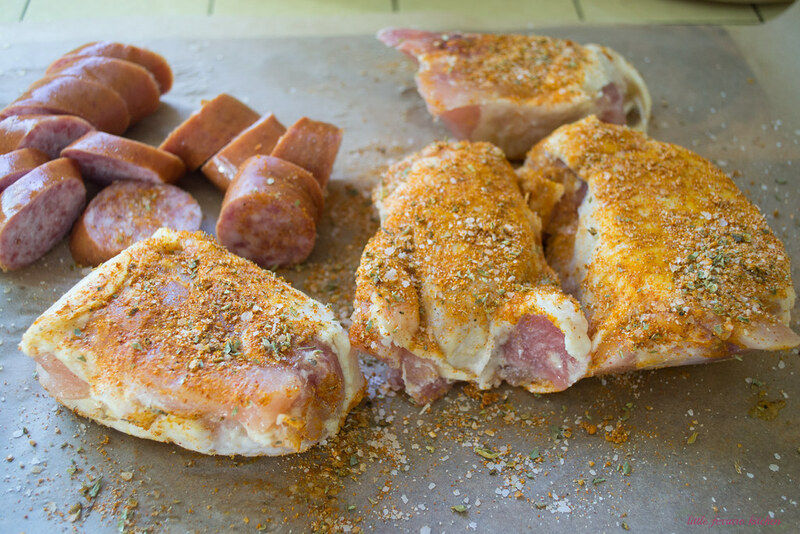 Then season the chicken thighs and pork bones with adobo, sazon seasoning, salt and pepper. 2) Drizzle olive oil in a large dutch oven and sear the pork bones and chicken on both sides until outside is golden brown. Then add sausage and sear on both sides. 3) Next, add 2 heaping tablespoons of sofrito to the pot, stirring a bit to coat everything. Add 8 cups of water and 2 chicken bouillon cubes (or I use a few teaspoons of concentrated stock instead) and stir everything together. Bring stew to a boil and then simmer for about 20-30 minutes or until the chicken cooks through. 4) While stew simmers, prep the vegetables. Yucca has a very thick waxy exterior, so take your time peeling and cut into large 1-2 inch pieces. Do the same with the plantain, butternut squash and corn. 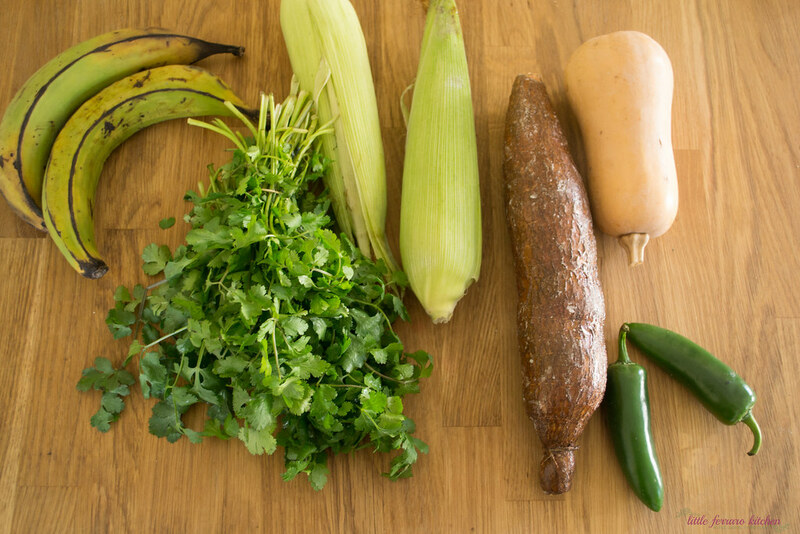 5) Then add yucca, plantains and corn and continue cooking stew for 10 minutes until they begin to soften. Then add the butternut squash and a handful of fresh cilantro. Season with salt and pepper and taste for seasoning. Place a lid on a stove with a bit staying open and continue to cook the stew for another 20-30 minutes or until all the vegetables are cooked through and tender. 6) Serve stew with sliced avocado, fresh cilantro and rice (optional). First, add all the adobo spices together in a bowl and mix well. Do the same with the sazon. Then season the chicken thighs and pork bones with adobo,sazon, salt and pepper. 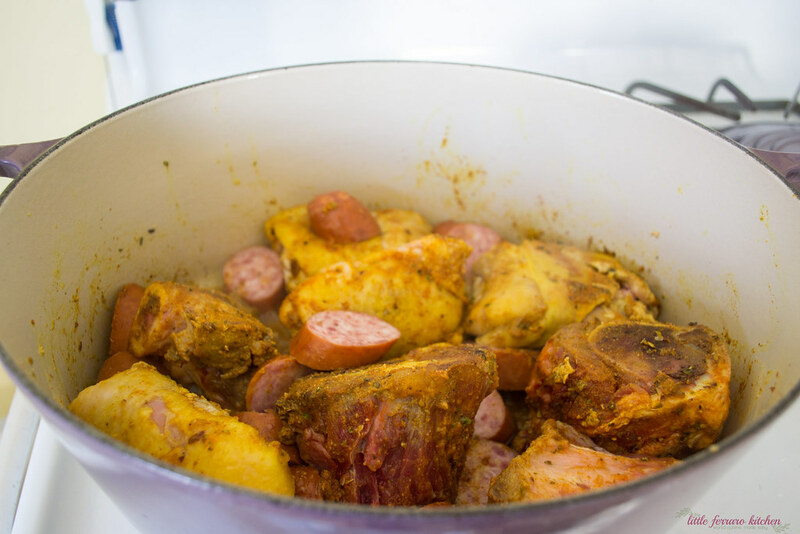 Drizzle olive oil in a large dutch oven and sear the pork bones and chicken on both sides until outside is golden brown. Then add sausage and sear on both sides. Next, add 2 heaping tablespoons of sofrito to the pot, stirring a bit to coat everything . Add 8 cups of water and 2 chicken bouillon cubes (or I use a few teaspoons of concentrated stock instead) and stir everything together. Bring stew to a boil and then simmer for about 20-30 minutes or until the chicken cooks through. While stew simmers, prep the vegetables. 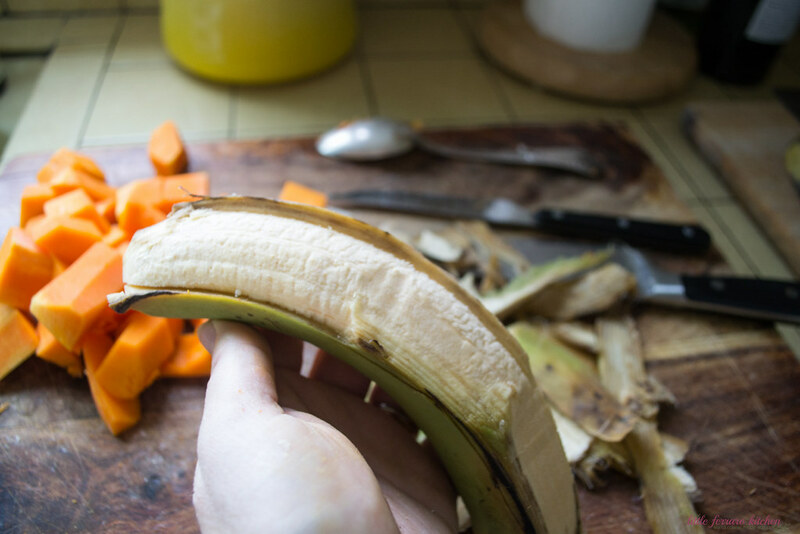 Yucca has a very thick waxy exterior, so take your time peeling and cut into large 1-2 inch pieces. Do the same with the plantain, butternut squash and corn. Then add yucca, plantains and corn and continue cooking stew for 10 minutes until they begin to soften. Then add the butternut squash and a handful of fresh cilantro. Season with salt and pepper and taste for seasoning. Place a lid on a stove with a bit staying open and continue to cook the stew for another 20-30 minutes or until all the vegetables are cooked through and tender. Serve stew with sliced avocado, fresh cilantro and rice (optional). The softrito recipes makes more than needed for the stew. Freeze the rest in ice cube tray and use for future soups and dishes. That is one beautiful bowl of goodness! Try Kabocha squash, it tastes just like auyama and easy to find in SoCal. Thank you! I just came back from Dominican Republic and am just preparing an article about things to do and eat. I will definitely try this recipe out :)! Well done. Have a great day! Thank you!!! Wow what a fun trip! Looking forward to seeing your article as well! Today was the first day I ever tried this stew , and it was awesome ! It is so so good, hearty and full of all sorts of vegetables! Thank you Tonya! It is not yucca. It is yuca. I have seen both spellings actually…thank you for mentioning that. Although it seems a common mistake, yucca is a totally different plant. Yuca is the tuber from the Cassava plant – where you get Tapioca Pearls. It is the 3rd-most important staple crop in the world. Yucca is part of the Agave family – related to the plant Tequila is made from. Though some of the species have edible parts, they seldom are eaten. By the way, Tequila is not made from Yucca, it comes from the Blue Agave plant. The Yucca plant looks like a palm tree, while the Yuca plant looks like a marihuana plant with extra leaves!!! Aloha! Thank you for the great recipe, Samantha! It reminds me of my late grandmother, who used to cook it and bring this huge container to our home all the time. I’ve always wanted to learn more about Dominican food. Hey thanks for posting ! 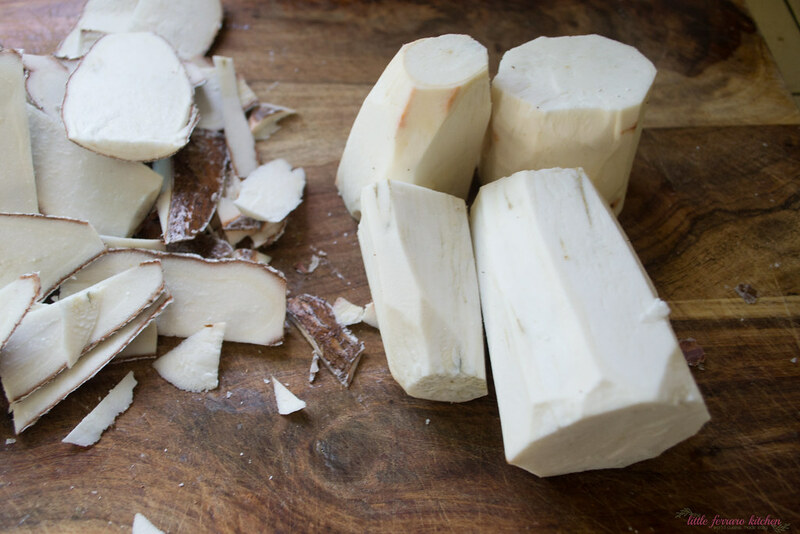 One of my favorites to add is taro root (also known as yautia or malanga ). I live in NYC SO it’s easy to find. Different types of sweet potatoes are good too . Pretty much any tuber or squash can work ! Hi Nick! Didn’t know taro would work in this…thank you for sharing!